SunGuard UV Protectant helps extend the life of outdoor products. Clear, non-yellowing, patented formula. 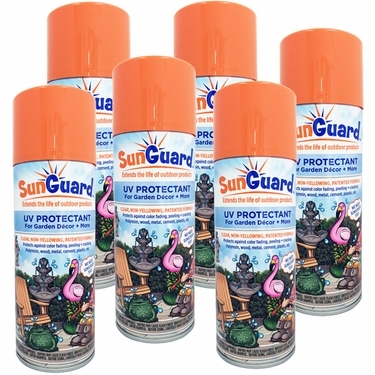 SunGuard is a clear, non-yellowing, UV Protectant spray that protects all types of outdoor d�cor, furniture and garden accents against fading, peeling & cracking! Extends the life of all outdoor products made of polyresin, wood, metal, glass, cement, plastics, tile, wicker, dried/silk flowers, and other hard to bond surfaces. May 2016 Top-Selling Product in Spring Garden Show! We could not be more excited about a product other than SunGuard UV Protectant Spray! We've been searching for this product for years! Purchasing from dozens of suppliers and manufacturers, we've never had a good solution for the underlying question of care and maintenance as it pertained specifically to what could be done about products fading from the sun. As it turns out, regardless of what UV protected paints are used or topical clear coatings applied, within only a few months the sun would break down any initial protection and nothing could really be done after that aside from maybe some polyurethane but nobody likes that because it cracks and yellows over time. We have waited long, but we finally have the perfect product we've been looking for: SunGuard UV Protectant for Garden Decor & More! SunGuard UV Protectant is a solutions-based product that helps extend the life of outdoor products. This patented spray formula was specifically designed to provide UV protection to outdoor garden decor to help protect against fading, peeling and cracking. Extremely versatile it can be used on many substrates, even including metal, plastics and resins! You now have the option to refresh your outdoor products with new protective UV coating and know you have the best and strongest sun protection available on the market today. Would you go out into the blazing hot sun without sunscreen? SunGuard is like sunscreen for all our outdoor garden decor items!